The Order of Our Lady of Mt. Carmel, rooted in the contemplative tradition of the Church, had its beginnings in the Near East where on Mt. Carmel a small group of hermits, looking to the prophet Elijah as their inspiration and the Mother of God as their guide, came together under the Rule given them by St. Albert of Jerusalem. Some of them put down the sword of the Crusaders and, taking up the sword of the Spirit, dedicated themselves to a life where “each one will remain in his cell or nearby it, meditating day and night on the law of the Lord and keeping vigil in prayer.” Due to strife and unrest in the Middle East, the hermit brothers migrated to Europe, adapting their way of life to the new demands of the times. In 1452 a group of beguines were drawn to the Carmelite spirit, and a century later St. Teresa of Avila initiated her reform which spread throughout the world and became known as the Discalced Carmelites. 1790: Three American Carmelite Nuns, natives of Maryland, who had entered the Hoogstraet Carmel, along with a Dutch Sister from Antwerp, came to Port Tobacco, Maryland. 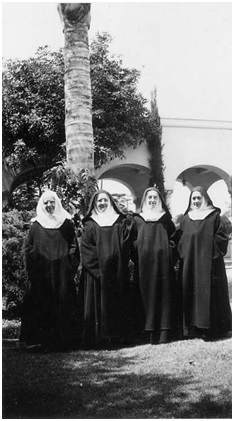 On July 21, 1790 they established the first Carmelite Monastery in North America and the first community of religious women in the thirteen original States. 1926: The Carmel of San Diego was founded from Santa Clara on June 11, 1926.